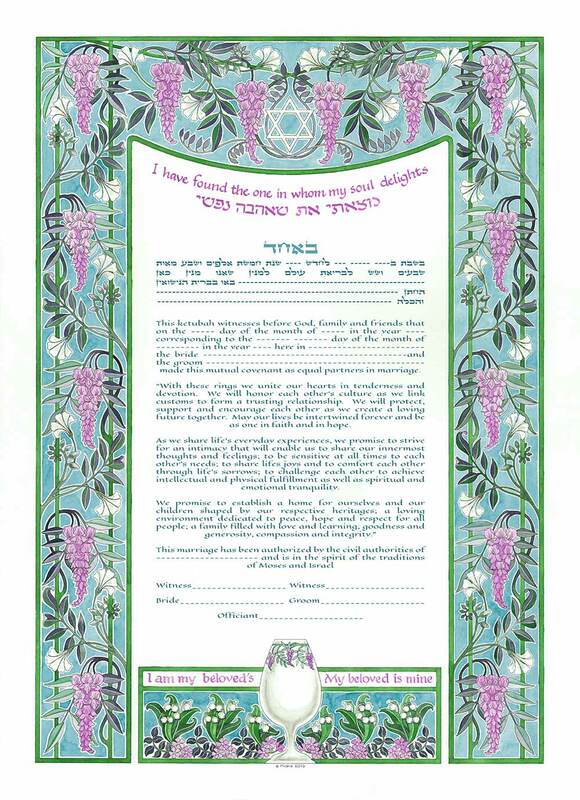 Each Ketubah is individually created and printed using digital giclee technology. Choose the Text, Size and Color of your choice in the drop-down menus below. If Paper, would you like to add a Free Extra White Border? 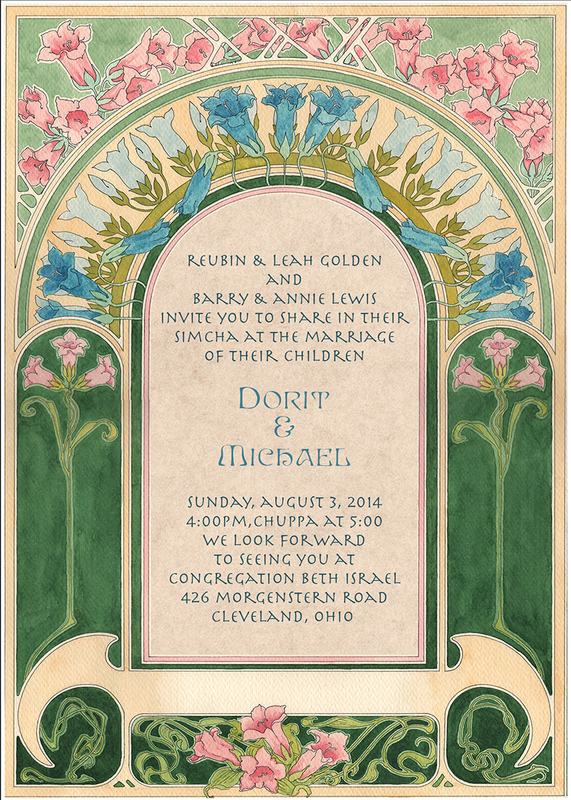 If Canvas, how would you like your Ketubah finished? 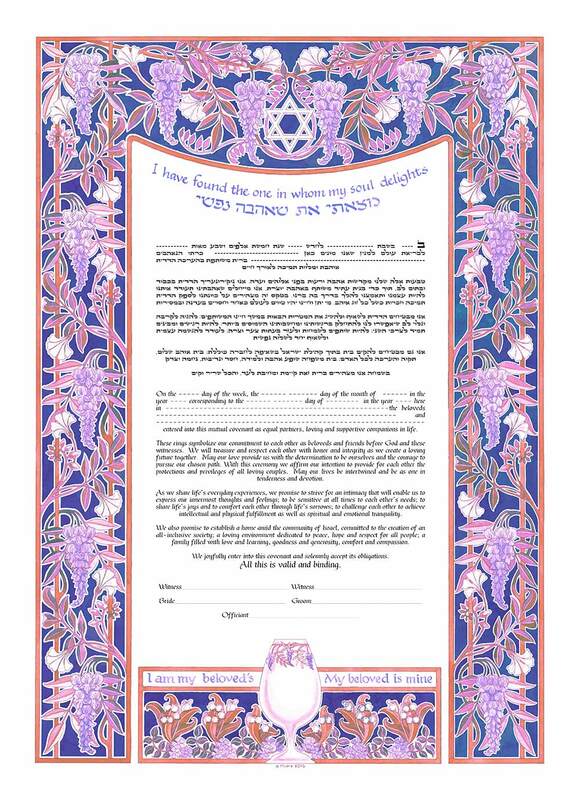 Tell us your wedding date, so that we can ensure your ketubah will arrive in time. In over 25 years, we have never been late to a wedding. 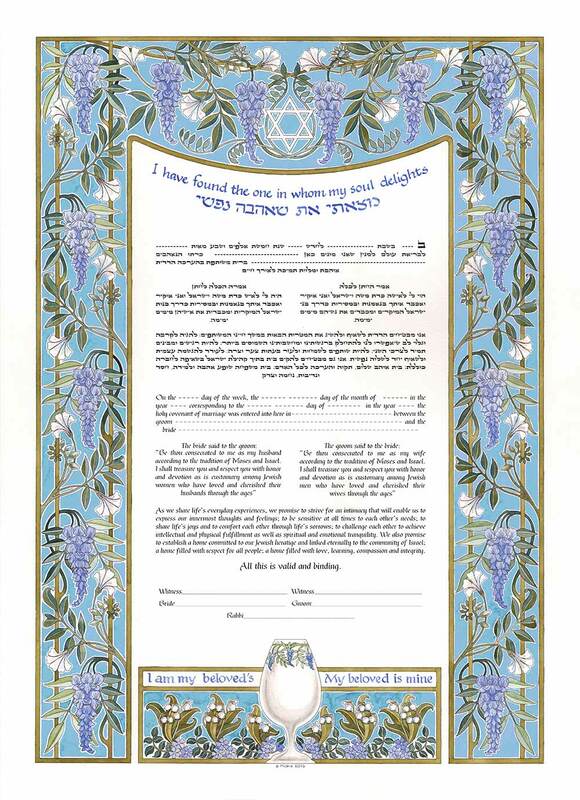 After completing your purchase, you will receive a link to the proper form in order to personalize your ketubah. 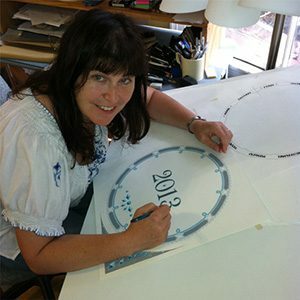 The Huppah Giclee Ketubah by Mickie Caspi is an individually produced giclée print that is offered in several different choices of colors and sizes, and is customized with all of your personal information. This lovely and unique work of art was originally hand painted using fine watercolor paints and inks on Strathmore 300 series watercolor paper by Mickie. Mickie will personalize the text of your choice with all of your pertinent information and can help you with spelling, dates and other information. She has been crafting ketubot for brides and grooms for over 36 years, speaks and writes both English and Hebrew, and has lots of experience with all kinds of requests. If you have any questions at all, don’t be shy! Contact us via email or phone (1-800-538-8268). That’s what we’re here for. If you want to read the actual ketubah texts, click on the Read Ketubah Texts link. You can see samples of other original ketubot (plural of ketubah) at Mickie’s Original Gallery. 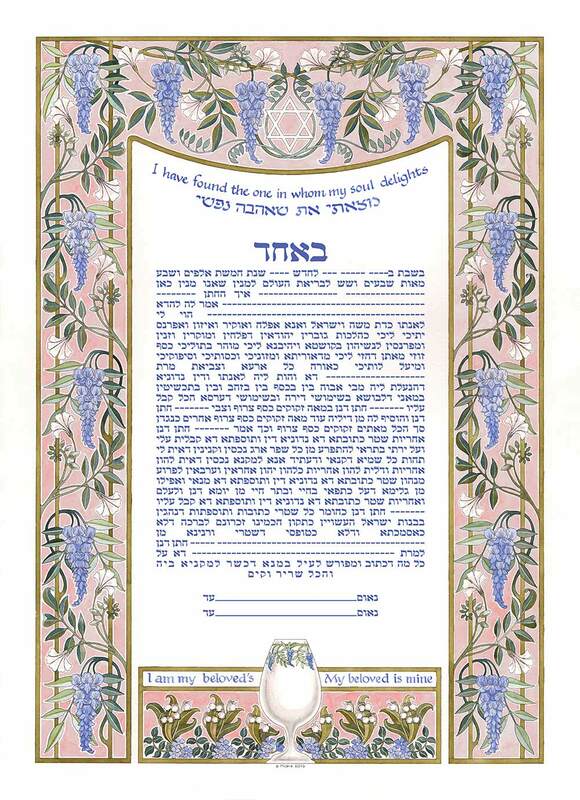 The best time to order your Ketubah is a few months before your wedding. We know that the best laid plans sometimes go awry and very often Mickie will create rush ketubot – some as late as a few days before the wedding. The custom giclée artwork can take a week or two to complete, so please leave enough time. 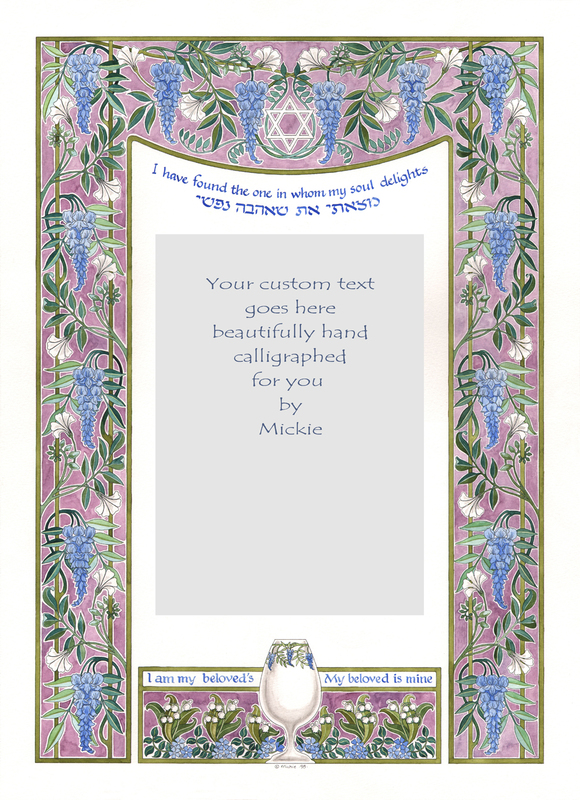 It is usually never too late to receive a personalized ketubah, but Mickie is not a machine. Sometimes we are out of town or sick. Please email or phone (1-800-538-8268) us if your wedding date is a week or less away to make sure that we can complete your ketubah for you! When ordering, please tell us your wedding date, so that we can ensure your ketubah will arrive in time. In over 36 years, we have never been late to a wedding. Caspi Cards & Art offers a wide range of texts so that you can find the one that is right for you. If you would like to use a text that you have written yourself, you must supply your own text in a word document that has true Hebrew right to left in addition to the English (otherwise there is a $200 fee for preparing your text). If you need your English text translated into Hebrew, the translation cost is $150. Choose the Text, Size and Color of your choice from the drop down menu. 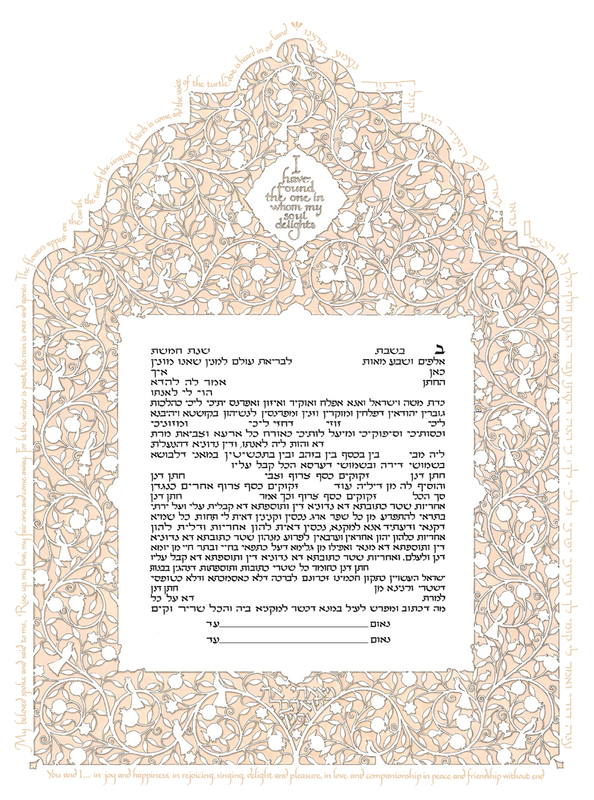 After placing your order, you will receive by email the ketubah personalization form. Submit the completed personalization form online (or print it out and email/fax to us). You will receive a proof by email to review and share with your rabbi or officiant. 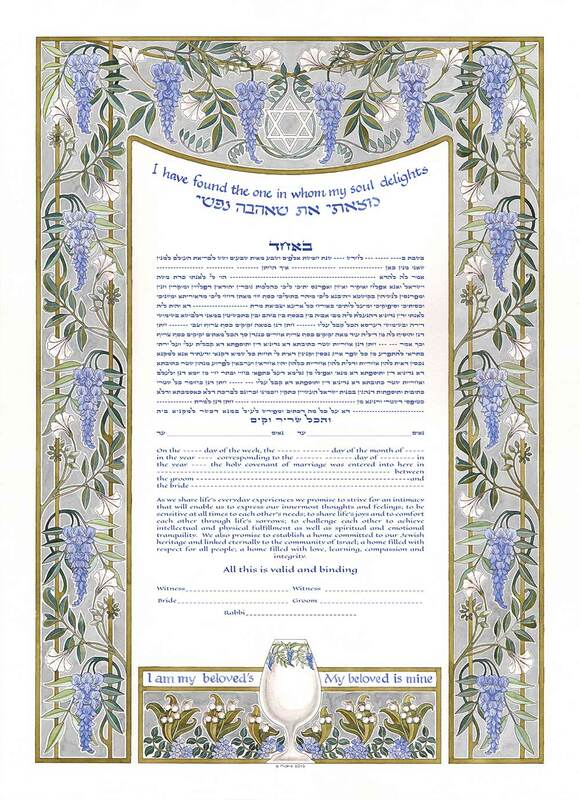 When you have approved the proof, we will print your ketubah and ship it. You will receive tracking information by email when the ketubah has shipped.